Despite a widespread feeling that the US-North Korea nuclear talks have stalled, the North Korean leader’s rare end-of-year letter to President Moon Jae-in indicates his willingness to break the deadlock by means of his New Year’s address. In his letter, Kim vowed to meet Moon “frequently” next year to discuss the denuclearization of the Korean Peninsula and work together to resolve the issue, the South’s presidential office Cheong Wa Dae said Sunday. He also expressed a strong determination to visit Seoul -- which he had promised to do by the end of 2018 at the September inter-Korean summit, though the visit did not materialize -- while keeping a close eye on the situation. Kim’s failure to make the visit as planned has left the North Korean leader feeling “much regret,” he added in the letter. 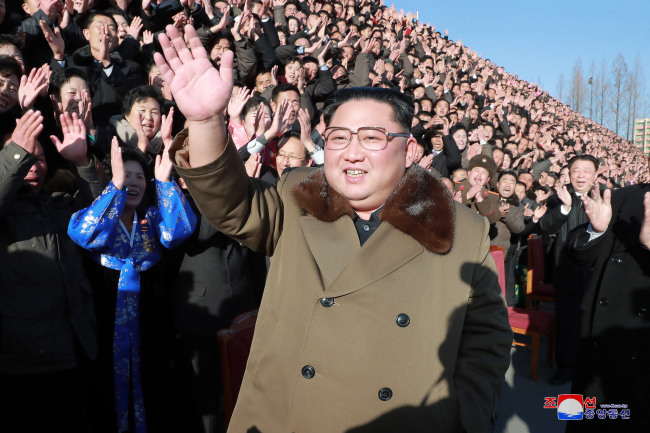 Kim’s message was delivered merely days ahead of his expected New Year’s speech, which analysts say will set the tone for the nuclear talks and determine the momentum of negotiations between Washington and Pyongyang for 2019. “Though the letter doesn’t directly mention the talks between the US and North Korea, it is indirectly conveyed though Kim’s regrets in not being able to carry out his end-of-year Seoul visit, which is actually believed to be an intentional move he made on the back of stalled US-North Korea talks,” said Koh Yu-hwan, a professor of North Korean studies at Dongguk University in Seoul. “The US has expressed anticipation for its next possible summit with North Korea and it seems North Korea wants progress in talks by keeping the momentum alive. North Korea would not gain anything if the stalling continues and this would likely be reflected in Kim’s New Year’s speech,” he added. Washington has been softening its stance against the North in recent weeks -- perhaps in an effort to coax Pyongyang to break its silence -- with US National security adviser John Bolton saying on Dec. 7 that his country will consider providing sanctions relief when the North shows some “performance” on denuclearization. Stephen Biegun, the US special representative for North Korea, also said Dec. 19 that the US is reviewing whether to ease its travel restrictions to the North to facilitate humanitarian aid to the communist state, during his visit to South Korea. North Korea has remained mum about this gesture, but experts say that by mentioning denuclearization in the letter, the country has indirectly expressed willingness to continue its dialogue with the US. “By reiterating its willingness to denuclearize to the South, which remains the US’ closest ally, it is saying that it is expecting results from its talks with the US early next year,” said Kim Sang-ki, director of the unification policy research division at the Korea Institute for National Unification. Sunday’s letter is also a solid preview to a positive message that the North will deliver regarding inter-Korean ties, experts agreed. Despite escalating hopes, in order for the US-North Korea talks to truly make progress, Kim will have to announce specific plans surrounding the concessions he will make to Washington, including the submission of a full inventory of its nuclear weapons and the permanent shutdown of its key nuclear sites such as Yongbyon and Tongchang-ri, critics say. Observers say the US-North Korea relationship next year will hinge on what Kim chooses to say on Jan. 1. “His words may determine whether the peace mood continues -- or if conversely, the US-DPRK relationship, in particular, deteriorates: whether it reverts back to snarling and missile testing, or even worse,” a US-based North Korea monitoring website 38 North said in a report released Sunday. US President Donald Trump said last week that he was “looking forward” to his second summit with Kim, which the US says may take place early next year.